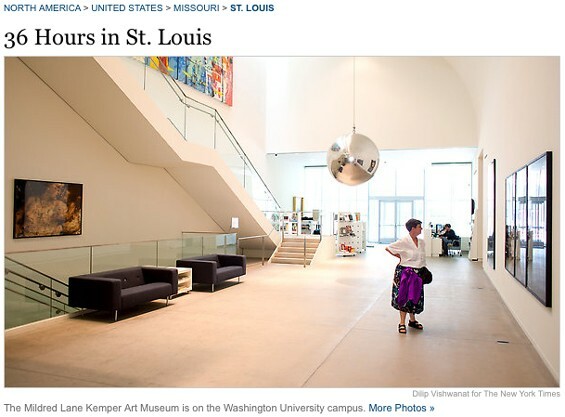 OMG, New York Times Deigns to Notice St. Louis! It's so sad that we get so excited when someone from the East Coast bothers to notice our humble little Gateway. Shouldn't they be excited to know that we look up to them, that they're as important to the little ol' Midwest as they think they are? Sorry, that's an incredibly stupid question. Anyway, the New York Times' Travel section has deigned to notice us once again in its "36 Hours" feature. (It first visited in 2006 and again in 2008.) 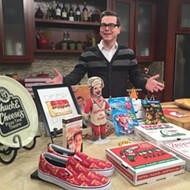 While this piece isn't as gushy as a Chicago Sun-Times writer's junket visit to the Delmar Loop in January, it does send visitors farther afield. Among the recommended spots: the Mildred Lane Kemper Art Museum, Cherokee Street (including Apop Records, the Mississippi Mud House and phd gallery), Franco, Pappy's Smokehouse, SweetArt, Citygarden, Local Harvest Cafe, the Royale, Winslow's Home and Fred's Six Feet Under at Iron Barley.